These are 4K test clips straight from the RX0 ii: no recompression or any alteration in post. No attempt to make an interesting or pretentious or spoof video, just show what 4K in default everything produces. You can download the original clips. Note: the new model has AFS in movie mode - there was no autofocus of any kind in movie mode on the original RX0 - only zone focus and manual. AFS is quick and accurate, and you can choose the size of the zones and you can focus lock with half press in video mode. It is contrast detect, of course. Using electronic stabilization does NOT crop. 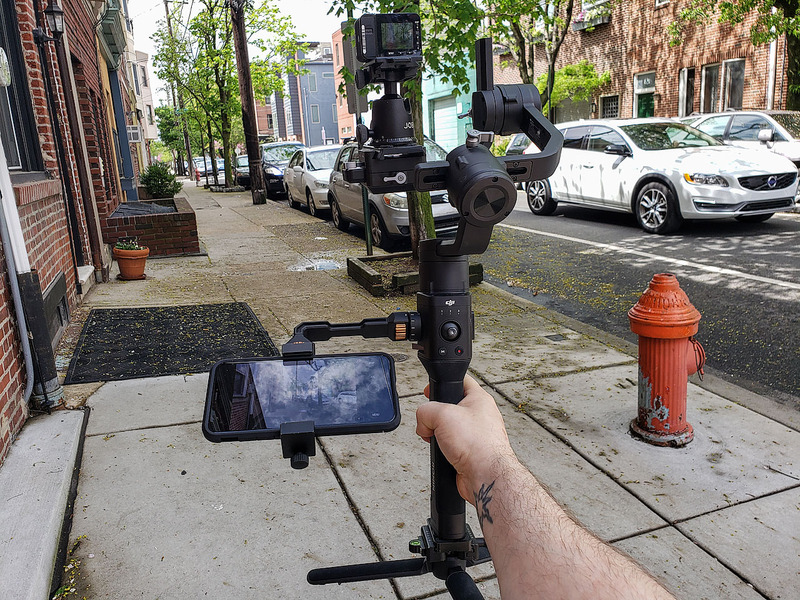 It is not as good as the Hero7 Black digital stabilization, which does crop a lot, or the DJI Osmo Pocket. But it is better than I thought. Only one shot here is handheld. Cameras mounted side by side on a tripod. The first clip in each scene is from the Osmo, followed by the RX0 ii. Both shot in Standard color at 4K 30P at 100 Mbps. All auto. No alteration in post. What you can see is that the RX0 ii is less saturated and less yellow and has wider lens (without distortion) and higher resolution. Last edited by markr041; 04-11-2019 at 04:42 PM. Added some saturation and contrast. You got your first, mine's still in transit. Nice. I'm surprised at how loud the motor noise actually is on the Osmo Pocket, the Sony's audio is much better. Have to be careful here. The Osmo audio is set for auto, so it automatically makes soft sounds loud - AGC. The Sony audio was set manually at a midpoint. So, soft sounds are soft. You can set the Osmo audio to low or medium or high also. The audio on the Sony is better, it is stereo and you can set it manually over 20 different values. But the video is not informative about audio quality. Sure, I get that. It's just that for some reason I had not considered that its motor noise will transfer to the mic, as is the case with other gimbals, because it's so small. But that particular type of noise, it definitely sounds like the motors, amplified by AGC. The Sony would not have that issue go I'd expect AGC to amplify the "actual" noise floor of the circuitry instead, or else environmental noise. I prefer the Osmo picture. Colors are richer (not necessarily more accurate), contrast is deeper and the picture is devoid of the micro jitters I see on the Sony. It also appears like the Sony has a bit of edge enhancement going on. It's just seems a bit over-sharpened. The EIS in this camera is much better than I thought. First, there is no crop (unlike the GoPro Hero7 Black), so it does not seem to lower resolution even in 4K. Second, it is very stable. Not good enough by my standards for walking with the camera, but others may even find that ok. And not equal to a gimbal, but as good as Sony IBIS in its big cameras. This video was shot in Slog2, which has a native ISO of 1000. Slog2 expands the color gamut and dynamic range to the maximum of the camera. The color is now better than on the Osmo Pocket, as is the DR, not surprisingly. There is also Clear Image Zoom, which give you a 1.5X zoom in 4K, with little loss in resolution. One clip uses the zoom at maximum. I agree, the RX0 ii Standard color definitely lacks contrast and color saturation. This seems to be the new "Venice" look that Sony uses on their Venice camera and also in the revised FS5 ii. I think it is emulating ARRI color! One can add saturation and contrast to get richer colors and a better-looking image. But I shoot Slog2 anyway (8bit be damned). I think there is also less sharpening with that. And sharpening can be reduced even in Standard. On stabilization, every shot was done on a tripod but one. This is an RX0 ii excerpt from the comparison, which ups the contrast and saturation. Last edited by markr041; 04-14-2019 at 10:08 AM. There is even a zoom! Last edited by markr041; 04-14-2019 at 06:59 PM. Osmo Pocket continues to impress. I'm guessing the Sony will pull ahead in lower light. At least I hope it does. The Osmo mono audio, even with the kludgy external adaptor, is quite bad. The worst among any competing cameras. The Sony has full manual control, stereo and easy external capability. The Osmo audio is a big problem. I'm not using it for audio at all, agree there Sony is the better vlogger cam by a giant margin for that and the (presumed) low light capability. It's too bad Osmo Pocket does not have stereo mics on the front of the unit. I'm curious about the "extra" stabilization you can do in post with the Sony using the app & motion metadata. You try it? Lensrentals is shipping my review unit today. I have not tried. Mostly because the ouput video is only 1080. A caveat here, a caveat there... did not know that. Sounds like I'm gonna have to feed 4K RX0 II output to Mercalli to get what I want out of it unless I put it on a gimbal. But recently I've been using the a6500 on the Ronin S with Sony's 10-18mm lens and now I'm pretty much resigned to carrying a backpack with me just to have access to that kit. Especially with a ECM-XYST1M mic. I hope an Osmo Pocket Pro with a 1" sensor appears. I'd pay $1000 for a robust device. All the sitar music, which is part of the sound track, was recorded by the RX0 ii. In order to get this to work with the Smooth Q, did you have to do anything special to mount it? Look for the video on the RX0. Quite a YouTube channel that gentleman has, I'm glad to know about it. Thanks for the link. I just got the RX0 II and have not gone outside yet due to lingering crap weather. But I'm seeing the first signs of the sun and by adding a ball head to the Ronin S I was able to get the balance. Obviously not nearly as practical as a Smooth Q but it's working right here now.